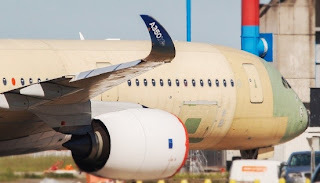 A350 XWB News: MSN1, the first flying A350 XWB, in the way to the paint shop. MSN1, the first flying A350 XWB, in the way to the paint shop. The first Airbus A350 XWB jetliner made a short trip to the paint shop Monday as it readies for its coming first flight. It’s an extremely rare moment in the life of any new jetliner and happens about once per decade for passenger plane manufacturers. A person familiar with the 300-passenger A350’s preparations say its Rolls-Royce engines could be powered-up for the first time as soon as the next 2 weeks once it leaves the paint shop.